Another dish I had made called for only half a pint of blueberries. Not having any immediate plans for the remaining berries, I started looking for a recipe. This is not something I’d usually pick. 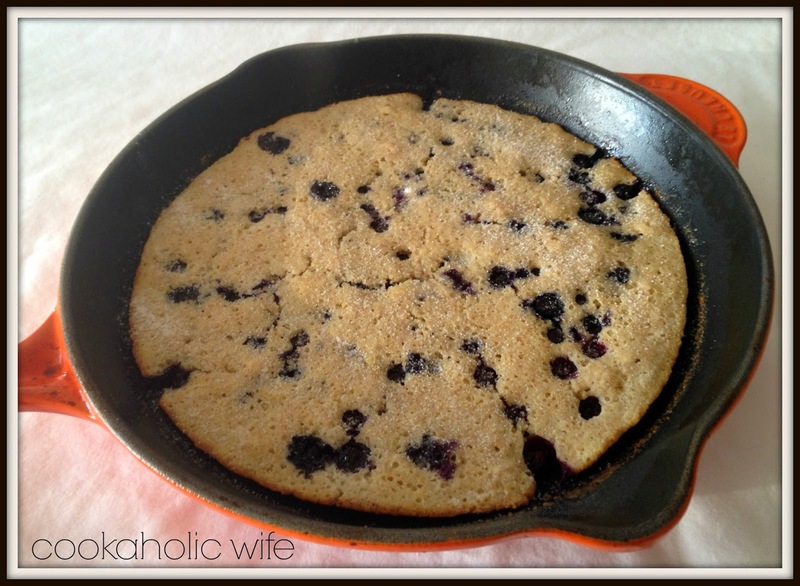 Blueberries in a skillet sounds like a recipe for disaster in my head, although I know many people who cook with their cast iron skillets all of the time. I guess because I’ve never watched anyone else cook in one (Food Network aside) I’m still slightly hesitant to use mine. I was pleasantly surprised at how well this turned out and how easy using the cast iron was! 2. Whisk together the buttermilk, egg, vanilla and butter in a measuring cup. 3. Whisk together the flours, 3 tablespoons of sugar, baking powder and salt. Pour the wet ingredients into the dry and mix until just combined. 4. Melt the remaining 1 tablespoon of butter in a 10 or 12 inch cast iron or oven-safe skillet. Pour the batter into the skillet. 5. 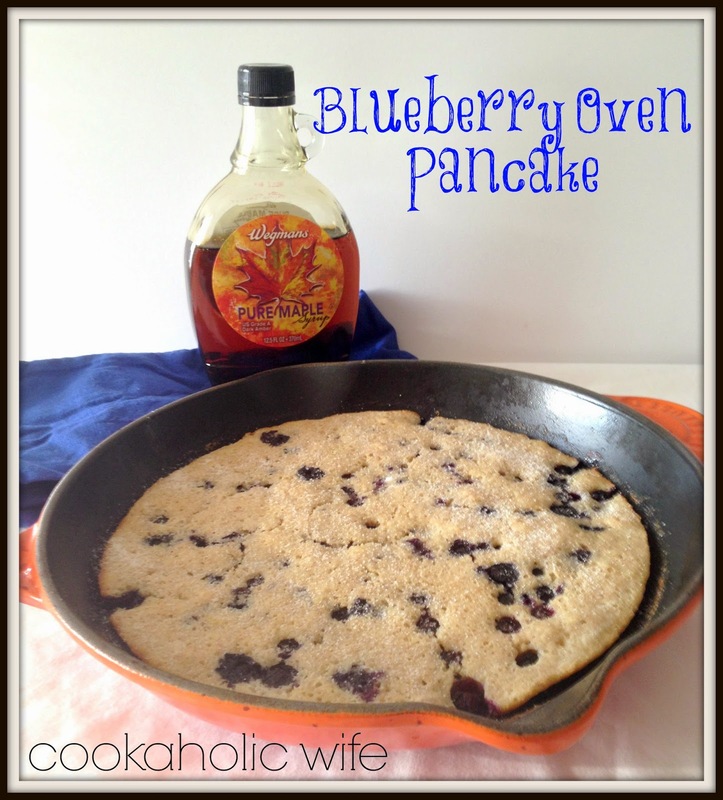 Sprinkle the blueberries on top along with the remaining 1 teaspoon of sugar. 6. Return the skillet to the oven and bake for 20-25 minutes or until golden brown. Allow to cool for 5 minutes before dusting with powdered sugar. Slice into portions and serve with maple syrup. This was delicious! I don’t think I ever want to make pancakes the regular way again. And it was so much easier! You don’t need to stand there constantly waiting for the air bubbles to form, then worry about flipping them over, then trying to keep the first ones you made warm while you work your way through the batter…yeah oven pancakes are totally the way to go! I’m sure this would be equally as delicious with other fruits as well. Diced apples, peaches, pears, plums, other berries…I’m sure the possibilities are endless. I just know I want one of these pancakes again!